A CANYON IS A deep, narrow passage cut through the surface of the Earth with steep cliffs on both sides. 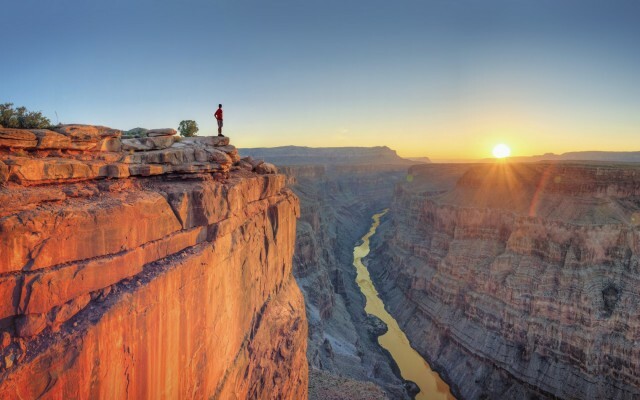 Sometimes called a gorge or ravine, canyons are often formed in mountainous, arid, or semiarid regions where riparian EROSION is much greater than erosion from general weathering. They range in size from an arroyo, or ditch, to the GRAND CANYON, with its depth of more than a mile. Canyons can be found all over the world, at the bottom of the ocean, and even on other planets. The word canyon is thought to originate in the Spanish cañon, which means “tube” (from the Latin canna, a reed). This root is descriptively accurate because canyons are frequently in the shape of a tube, having been carved by the constant flow of water between surrounding walls. Canyons are formed and deepened by erosion from moving water and may be widened by landslides. A number of canyons were carved out of the Earth by massive glaciers, some more than a mile thick, which took millions of years to cut their way through solid stone. As the surface of the Earth has been shaped by climate over eons, cycles of ice age followed by thaw have occurred, and much land that is desert today was under water at some time, submerged below ancient seas. These ancient seas deposited sediments, which settled in layers, and nowhere are those layers more evident than in the walls of a canyon. As snows melt and collect in rivers, the force of water slowly carves channels through these layers, exposing the history of the land in a sedimentary cross-section of Earth. These exposed layers offer an excellent living laboratory for scientists to study the geological changes in the Earth’s crust. For example, at the Grand Canyon’s rim, the Earth is only 250 million years old in places; on the floor of the canyon, the most ancient layers are thought to be up to 1,200 million years old. As rivers erode deep into the canyon floor, they become entrenched and cannot easily alter their course, thereby deepening themselves further, faster. These rivers become deeper and canyon walls become higher and higher. The Grand Canyon slices through the Earth’s crust for 217 mi (347 km) miles from beginning to end. It averages 10 mi (16 km) across—almost 20 mi (32 km) at some spots—and over 1 mi (1.6 km) deep. The Snake River and its Hells Canyon are another example of river entrenchment; while such canyons are massive, they are not the biggest on Earth. That honor goes to the canyons that form on the ocean floor, called submarine canyons. Submarine canyons, forged by some of the same forces as canyons above sea level, dwarf the Grand Canyon in magnitude. The force of rivers emptying into the ocean, massive underwater landslides, and mudflows combine to carve out submarine canyons. One of the largest of these canyons, the Great Bahamas Canyon or Trench, measures 14,000 ft (4,575 m) from rim to floor; that’s twice as deep as the Grand Canyon. As impressive as these numbers are, the biggest canyons in the solar system are not found on Earth. On the planet Mars, the Valles Marineris canyon system spans over 2,500 mi (4,000 km) from end to end—about the distance from New York to San Francisco— and has a depth of up to 6.25 mi (10 km). Scientists are interested in canyons on Mars because they may indicate the presence of water at some time in the planet’s history, and the presence of water on Mars—confirmed by NASA’s 2004 robotic-lander mission to the Red Planet—indicates the possible presence of life. Canyons are important for many reasons. Their striking beauty and the diverse flora and fauna that flourish there enrich the landscape and the lives of the people who experience them. They can provide information about climate changes in the past and may help predict climate changes in the future. They are also important to archaeologists because of the artwork and fossils found on canyon walls, and the cliff dwellings built in the steep walls of some canyons can teach us about ancient cultures.